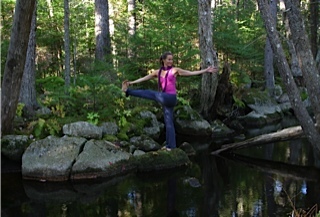 Find Balance, Joy & Vitality through Personal Health Empowerment! One of the most empowering things I have experienced in my Life is the gift of taking responsibility for my own health. It is TRUE empowerment, to understand that you really ARE what you eat, think and do. Therefore, it is totally within your power to change how you feel just by the choices you make! Personal Health Empowerment is SO important and this program will give you the tools and foundation to find that empowered space inside your self to create a health-full Life! Each component of this holistic, multi-faceted program will support you in a different way so you will be successful in reaching your healthy living vision. Yoga helps you get into and more connected to your body so you can cultivate the practice of deep listening while increasing, strength, flexibility, improving balance and opening more fully to the beauty and guidance of your own Being. The group workshops offer time for learning, exploration, community, celebration and group support. Weekly emails will keep you inspired and on track with your goals, and the monthly reading and personal explorations will help you explore and open to a deeper more authentic relationship with yourself and Life. The monthly reading and explorations will be fun and enriching and are offered as support and inspiration. One-on-one Wellness Coaching at a reduced rate gives you the individual support and focus you need. This is designed to be manageable, fun, and completely supportive! Surprise extra perks just for fun! Resources, Recipes & Tools for a lifetime of healthy living and more! *The program structure may be adjusted as needed to best serve the group. The 3-hour workshop may be split up into two segments with an online class for content and separate local meeting that can also be attended virtually. This depends on how many local vs. distance participants join the program, and what will work best for everyone involved. Distance participation is available for those who do not live locally. Please contact me using the contact form on this site, or by calling me at 207-374-3800 for more details and to discuss your interest in the program. Space is limited and pre-registration is required. This program typically fills up so be sure to sign up soon! I look forward to sharing this adventure with you. The program cost is $180/month made in three payments of $480 due November 1, February 1 and April 1. You are also welcome to pay in full. If you need to pay monthly to participate, please let me know. Payment by check or cash is welcome. To use a credit card through PayPal, the payments are $495 each to cover the PayPal fees. Payments can be made using PayPal through the registration page, and also through the button below. To register, contact us. “Participating in Sally’s 8-month program and cleanses has given me many valuable practices to add to my life from skin care to diet and exercise. It is such a supportive and non-judgmental, safe atmosphere that I felt like I could participate without feeling restricted– I could try the things I wanted to and not worry about being judged for not doing everything perfectly. Even my scientific skepticism was accepted. I am a scientist at heart but wanted to keep an open mind toward ayurvedic principles. I’ve found, though, that many of the dietary recommendations in the program are backed up by solid science–including reducing your chances of cancer, heart disease and even Alzheimer’s. Going through the 8-month program and associated cleanses gave me a structured opportunity to eliminate various foods and see what it was like. When I (and my husband) finally decided to make some changes for good– I found that my asthma was gone (I realized one day that it had been 5 days since I’d taken my daily inhaler!). My hay fever was also much reduced! I went from taking daily antihistamines in certain seasons to just taking it very occasionally. I also lost about 15 pounds and am back to the healthy weight I was at for most of my life! It took the scientific studies to convince my husband, but he has lost over 25 pounds since we adopted a healthier diet. He is now within the healthy weight range for his height, his blood pressure is lower and he easily hikes the trails at Acadia NP, when before he was stopping to rest a lot. I love working with Sally and value her advice, such that I think of seeing her before going to the doctor on many issues!” ~ L.G. “The 8-month PHEP was a gift that surprised constantly and surpassed all expectations. This course meant more to me than years of retreats, readings, lectures, and workshops. The learning continues to deepen and has become a part of my life. Sally is a compassionate and loving guide who shares her knowledge passionately and freely. The group setting inspired and enriched each month and the friendships gained are priceless. I would recommend the program to anyone interested in an opportunity to add more joy and vitality to their life.” ~ K.O. “Sally is devoted to health and mindfulness and her approach as a teacher is nurturing and totally invested. In her eight-month program, she created a safe space for us to really dive in and explore new empowering ways to enrich our lives. With the sustained time of the program, I was able to witness myself over time and better understand the cycles, patterns, and challenges I face in making healthy decisions. I learned practical tools and important insights that have transformed the way I take care of myself and my family. Sally’s desire for everyone to experience their most healthy and abundant lives is infectious and inspiring and I’m so glad that I gave myself the gift of her program.” ~ J. D.
“Thanks, as always, for all your time in this course. I believe this experience is priceless, and your teachings will be with me forever!” ~ N.H.
“The 8-month program went far beyond my expectations. With Sally’s guidance and nurturing, I gained knowledge, confidence, compassion, forgiveness, and personal empowerment. I highly recommend it!” ~ S.F. “I took the [8-month program] because at the time I heard about it, I knew I needed something to pull me together. I already knew Sally and was comfortable with her calm, kind, and gentle way of being. The group classes were very supportive, enjoyable, and enlightening. I have kept up with the daily practices I learned, and I am more aware of how I can create balance in what I do, how I feel, and what I eat for maximum well-being. My boundless energy is still there, but I feel much more grounded and in control of my emotions. There is a lot of freedom in the course to take in what serves a person best.” ~ N.P. “Having done yoga with Sally and a few seasonal cleanses, I was ready to dive into Ayurveda. The 8-month course proved to be everything I had hoped for and more. I came away with a much better understanding of Ayurvedic systems and theory. Also, deepening the practices over this long, sustained period – with the support of Sally and the group – made them stick.” ~ K.C. “[the PHEP program] is not something that will end at the last class. For me, it’s the beginning of a new way of living and experiencing my life. To you, Sally, I give SO many thanks for the model you are and for the work you’ve done to put together an amazing Health Empowerment Program for all of us!” ~ S.F. “The Health Empowerment program is a totally amazing – and challenging – journey. The eight months I spent with Sally and the other incredible women in our group transformed me physically, spiritually, and mentally. I gained a new understanding of how all aspects of our lives affect our health from foods to thoughts, to daily practices. Honoring myself by committing too deeply exploring my fears and habits with unconditional support from those around me enabled me to choose love – love of myself as well as of others. I am on a new path of power and enlightenment! Thank you, Sally – I am so grateful for you as well as for my wonderful traveling companions!” ~ D. F.